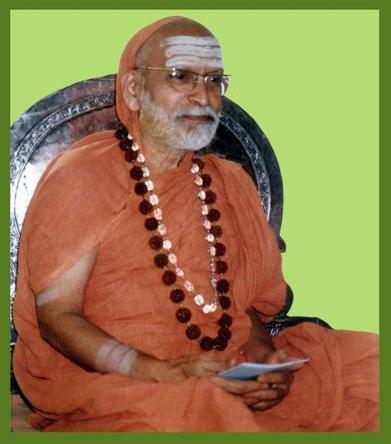 Here is a dialogue between the 35th Sringeri AchAryA, Jagadguru Sri Abhinava VidyAteertha MahAswAmin and a disciple, on the subject of karmayoga. The Jagadguru has clarified many of the confusions related to the practice of karma-yoga. This is excerpted from the book “Exalting Elucidations”, which is a collection of conversations, discourses, and incidents related to the Jagadguru on various topics including Dharma, Karma, Yoga, Jnaana, etc. In my experience, this is one of the best books in english which can clarify a SAdhaka’s confusions on many topics related to SanAtana DharmA. Disciple: What is the role of Karma (action) in spiritual life? AchAryA: If actions are done for the sake of Ishwara, without attachment to the fruits of actions, mental purity is attained. D: Will not one act inefficiently if there is no attachment to the results ? D: When one is not interested in success or failure, one cannot put forth one’s best. Is this not a logical conclusion? A: Only the opposite of this is true. An aspirant who does not have attachment at all will perform actions properly, as he does his duty as an offering to the Lord. Would any devotee like to offer to the Lord that which is improper? He will not. He who practises karma-yoga will not indulge in a bad deed. Further, he will offer all actions to the Lord. On account of devotion to Ishwara, he will strive to act to the best of his ability. As against this, he who has attachment to the fruits of actions will be bogged down by longings. D: Has this been spoken of in the Shaashtras also? D: Suppose a person acts with an idea that dedication of the results to Ishwara will ensure success in endeavours. Is he a practitioner of karma-yoga ? A: No. This is because he has not truly renounced attachment to the fruit of action. D: What makes the practice of karma-yoga difficult? A: Attachment to objects and lack of devotion towards Ishwara. A man having attachment may say that he has dedicated everything to Ishwara, but, actually, will not have been able to do so. In the absence of staunch devotion to the Lord, the ideas, “Everything should be dedicated. It is my duty to do so” will not be there. This again makes the whole-hearted practice of karma-yoga difficult. D: Is it enough if one is unattached to the results or should everything be positively dedicated to the Lord? A: If it is to be karma-yoga, one must dedicate everything to Him. D: Will AchAryAL kindly give an illustration to show that one who practises karma-yoga will perform one’s duty in a befitting manner? D: Who is competent to practise karma-yoga ? A: Anybody can practise karma-yoga. By the practice of karma-yoga, mind becomes very pure. Devotion towards Ishwara deepens. Realisation of the Truth dawns only in a pure mind. Hence, everyone should constantly resort to karma-yoga. All can derive benefit from it. D: Is it sufficient to dedicate merely the fruits of actiosn to Ishwara or should one dedicate the actions themselves? D: If one is engaged in karma-yoga, will one perform many actions? A: One need not. Actions may be classified into six categories. They are: (1) nitya karma (2) naimittika karma (3) kaamya karma (4) nishiddha karma (5) upaasanaa karma (6) praayaschitta karma. Nitya-karma is that which has to be done regularly at the scheduled time. Sandhyaavandana is an example of this. Naimittika karma is not governed by a recurring time restriction. Some of the karma-s to be done during eclipses can be cited as instances of this. Nitya and naimittika karma-s are ordained by the Shaashtras. Their non-performance leads to sin. That karma which one does with a desire for some achievement is called kaamya-karma. The shaashtras do not ordain these karma-s as obligatory. One does these only because of one’s desire. Nishiddha-karma is that which the Shaashtras prohibit. Karma-s connected with contemplation constitute upaasanaa karma. Finally that action by which sin is expiated is praayaschitta karma. These six types can be simplified considering only four categories, namely nitya, naimittika, kaamya and nishiddha karma-s. One should not indulge in nishiddha karma. Kaamya karma could be given up. However, one must perform nitya and naimittika karma-s. He who practices karma yoga will not get involved in all sorts of actions. Whichever act is necessary, he will do without attachment. Basically he will be concerned with nitya and naimittika karma-s.
D: One dedicates one’s actions to Ishwara to obtain His grace. In such a situation, how can it be said that one does not have attachment to the grace of Ishwara? Does not one perform actions with the target of securing it? Nonetheless, this is quite appropriate. This is because the wording has come down to us by tradition. Moreover, we can have the notion that we do the karma just for the sake of Ishwara. D: In practising karma-yoga, how can one ascertain whether one has made progress or not? A: I said there should be no attachment to the fruit of action. Is one unattached when one desires to know whether or not one has made progress in the path of karma-yoga? However, if one has a doubt about one’s progress in the spiritual path, one can introspect, “Is my mind pure? Am I peaceful? Am I carrying out all actions without any worry and for the sake of Ishwara?” This self-analysis will show whether one is following karma-yoga properly or not.